The Alamo is today a museum in San Antonio, Texas. It was originally built as a mission (for education and conversion to Christianity of the Native American population) by the Spanish Empire in the 18th century. It was later abandoned as a mission, and instead used as a fortress in the 19th century, and it is for the latter use that it is most famous. New printing includes a new introduction by Texas History Legend Stephen L. Hardin. When Phil Collins was a kid growing up in a London suburb, he would often watch an amazing show on his family television. There, in black and white, was Fess Parker as Davy Crockett, King of the Wild Frontier. As he matured, Collins not only acted out the exploits of his new hero, but he often refought the Battle of the Alamo with his toy soldiers. Even though music came to dominate his life, it was this love of history—and Davy Crockett and the Alamo in particular—that was always near by. On one musical tour, Collins encountered his first David Crockett autograph—for sale at a store called the Gallery of History. “I didn’t know this stuff was out there, that you could own it,” the rock-n-roll legend said. “It had never occurred to him. Later, he received a birthday present that would change his life: a receipt for a saddle signed by an Alamo defender. From that point forward, the drummer began building his impressive Alamo and Texas Revolution collection. Here, for the first time in history, are the artifacts, relics, and documents that compose the Phil Collins collection, available in a beautifully designed color book shot-through with stunning photography and crisply rendered illustrations. Collins’s prose takes the reader through the joys of being a collector as he lovingly describes what each piece in this impressive assemblage means to him. Photographer Ben Powell of Austin brought these items to vivid relief, and artist Gary Zaboly’s masterful pen-and-ink drawings breath life into the items. Essays by Texas historians Bruce Winders, Don Frazier, and Stephen Hardin provide the historical background to the collection and help make this into a work of art that also serves handily as a serious research tool. A huge, riveting, deeply imagined novel about the siege and fall of the Alamo, an event that formed the consciousness of Texas and that resonates through American history. With its vibrant, unexpected characters and its richness of authentic detail, The Gates of the Alamo is an unforgettable re-creation of a time, a place, and a heroic conflict. The time is 1835. At the center of a canvas crowded with Mexicans and Americans, with Karankawa and Comanche Indians, with settlers of many nationalities, stand three people whose fortunes quickly become our urgent concern: Edmund McGowan, a naturalist of towering courage and intellect, whose life's work is threatened by the war against Mexico and whose character is tested by his own dangerous pride; Mary Mott, a widowed innkeeper on the Texas coast, a determined and resourceful woman; and her sixteen-year-old son, Terrell, whose first shattering experience with love leads him instead to war, and into the crucible of the Alamo. As Edmund McGowan and Mary Mott take off in pursuit of Terrell and follow him into the fortress, the powerful but wary attraction between them deepens. And the reader is drawn with them into the harrowing days of the battle itself. Never before has the fall of the Alamo been portrayed with such immediacy. And for the first time the story is told not just from the perspective of the American defenders but from that of the Mexican attackers as well. We follow Blas Montoya, a sergeant in an elite sharpshooter company, as he fights to keep his men alive not only in the inferno of battle but also during the long forced march north from Mexico proper to Texas. And through the eyes of the ambitious mapmaker Telesforo Villasenor, we witness the cold deliberations of General Santa Anna. 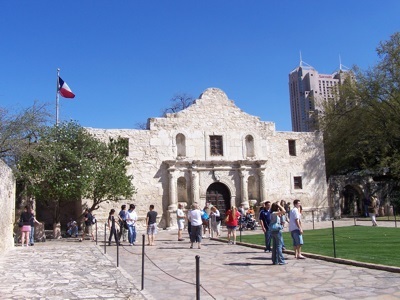 Filled with dramatic scenes, abounding in fictional and historical personalities -- among them James Bowie, David Crockett, and William Travis -- The Gates of the Alamo enfolds us in history, and through its remarkable and passionate storytelling allows us to participate at last in an American legend.